graduated school musician he has more to offer than the standard four to floor sound. 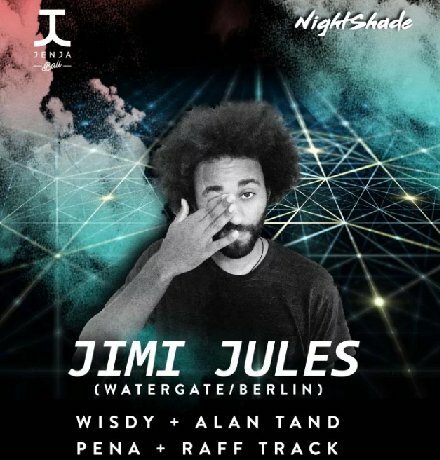 Jimi Jules is deeply dedicated to the house and techno scene and in the same time he likes the intimacy of a studio session, working alone or with other producers and musicians to discover new forms of music and energy. descendant from a tribe of Caribbean voodoo-sorcerers and a Swiss farmer and musician’s family has come a long way. He landed his first 1 hit Pushing On in 2013, became resident DJ at the renowned Watergate Club in Berlin as well as in Zurich’s techno snake pits Hive and Zukunft, kicked off a frisky side project together with his partner in crime Kalabrese called Jules et Spatz and started hosting the weekly radio show Wolt on Radio Ibiza Sonica. staggering beats and organic sounds - which were exclusively recorded by the charismatic multi-instrumentalist himself. With Equinox Jimi Jules has been putting out a massive load of spiritual and romantic energy into the universe and thereby proved his exceptional skills as a producer. Free entry is granted before 00:00, guest list closes on Thursday day 8 pm.